wownder: A Non Slippery Soap. Possible? A Non Slippery Soap. Possible? Never leave your soap in the bath tub. You may slip and fall if you step on it. But why does soap have to be slippery? Can we have a non slippery soap? Surely, a non slippery soap would be as useful as sliced bread. Is there any other way to clean, not using soap? 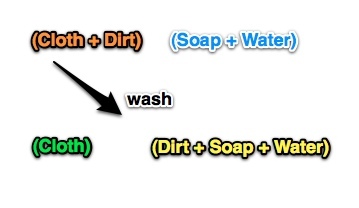 Let's examine how soap cleans dirt off our clothes. We have our cloth, it has dirt on it. We use soap and water to clean. Finally we want the dirt to go away along with soap and water and leave behind just the clean cloth for us. Right? Dirt actually sticks to clothes because of small amounts of oil. If the oil is removed, the dirt will come out too. Oil and water don't mix. But soap consists of strange little molecules that are attracted to both oil and water! One end of the soap molecule holds on to the oil, while the other end holds on to the water. Once the oily part is removed, the dirt can no longer stick to the cloth. It too gets on to the water. The soap molecules actually form small packets that enclose oil and dirt at their center. When you drain the soap water off, away goes the oil and dirt too! That's cool. Isn't it? But then why is soap slippery? Well, it's the water, you see! Water makes stuff slippery, right? Since soap molecules hold on to water, they are always covered with a layer of water. That's what makes them slippery. So, we can't have non slippery soap, right? Well, yeah. Soap, the way it exists today, has to be slippery. But we can try making it less slippery though. By mixing other stuff into it. For example, some manufacturers mix small grains made out of dried plants into the soap. It acts like a scrubber, and makes the soap less slippery to touch. Then there are soap pouches that you put the soap into. The cloth pouches give a rough surface that is less slippery. There are some exotic new ways to clean stuff too. One method uses sound. They use sound to vibrate the stuff to be cleaned so fast that the dirt particles get dislodged. Then we have dry cleaning. Dry cleaning is not really dry, it just doesn't use water and soap. Instead it uses other liquids (like petroleum) that dissolve oil. What are detergents? Are they different from soaps? Caterpillar becomes Butterfly. But Why? Lamps Get Dark Circles Too!